Mar del Plata (population 550,000) is an Argentine city located on the coast of the Atlantic Ocean in the Buenos Aires Province, 400 km south of Buenos Aires. As an important fishing port, industry concentrates on fish processing. The area is also host to other light industry, such as textile and food manufacturing. Located nearby are stonemasons which are used in construction. As part of the Argentina recreational coast, tourism is one of Mar del Plata’s main economic activities. Between five and seven million tourists visit Mar del Plata every year, occasionally quadrupling the number of residents. 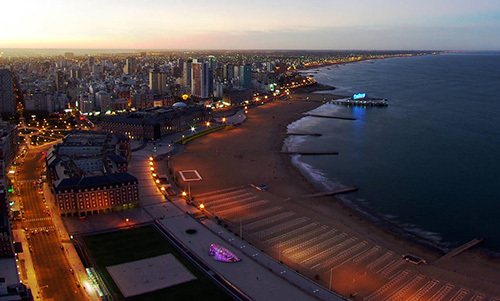 Mar del Plata has sophisticated tourist infrastructure to cater to the industry and as such, casinos, theatres and other tourist attractions are all located there. Mar del Plata is the most popular destination for conventions in Argentina after Buenos Aires. It has a wide range of services in this sector. Mar del Plata’s vivdly life assures activities going on every week of the year when it comes to entertainment. The Fiesta Nacional del Mar (“National Sea Festival”) with the election and coronation of the Sea Queen and her princesses; the Premios Estrella de Mar (“Sea Star Awards”) which honor the best shows during summer season; the Valencian Falla week; the Mar del Plata Moda Show, the numerous fashion shows that gathers the best haute couture designers, and the Mar del Plata International Film Festival, the only film festival “class-A” of Latin America.